All diaries below can be customized to your needs and desires. Please select a diary that best reflects you. ALL BRIDES ARE PROVIDED with a 30 MINUTE COMPLIMENTARY CONSULTATION. All meetings after are $50.00/1 hour. are able to encourage little changes. No refunds are provided due to the nature of our work. Renderings are a part of your world and ours. This Bride wishes for a traditionally composed design. Elements of paisley, centred mandalas and straight bands (below the wrist) are embedded for a simple yet rich diary. Custom details include fingertips, play of space, leaves and lattice work. Feet adorned (simply) till 2" above the ankle are also included. This Bride has an eclectic taste for fashion. Her lifestyle choices revolve around integrating cultures (motifs, colours and travel). ​They wish for a design with more negative space and lace trimmings. Feet adorned till (simply) 2" above the ankle. This Bride wishes for a one of a kind rendering with details inspired by her fantasy wedding. Bands of intricate designs outlined as Mughal Architecture and floating fillings fuse together. Negative space on the palms allows the design to breathe as the intricate flowers are all woven with leaves or whatever you wish to have done. Creating a unique rendering for this Bride; the compositions are of our personal favourites. These designs are works of Art merging cultures seen in that exceed the traditional compositions. The unique arrangement of florals and filigree move freely along the arms and feet as if a poem was being versed. The negative spaces of our PLATINUM A Diary give a sense of detail and length. Floral bouquets keep the design looking fresh. 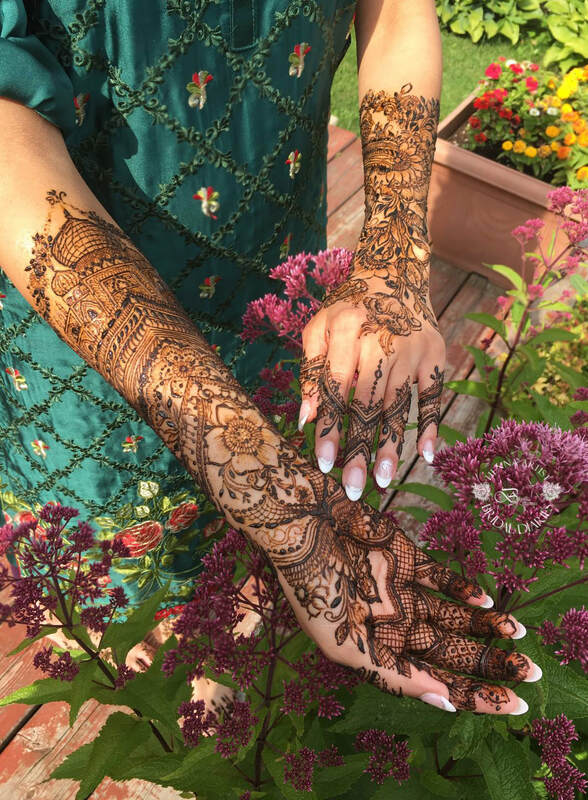 This Bride worships Mehndi. 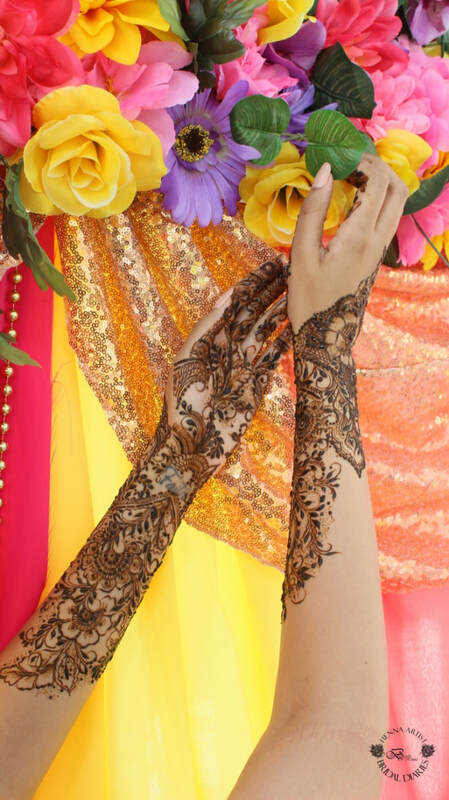 The term Mehndi is the translation in urdu/hindi for Henna. Intricate details that they share with their beloved are composed within the motif regions on the exterior and inner arms. Feet are laced with directional lines; framing the feet with puzzles of florals, mandalas, leaves, mughal architecture. Anything that they may wish to have. Negative space is a great divide between the collection of antique like details in this Bride's diary. This is our fantasy Bride. YES! 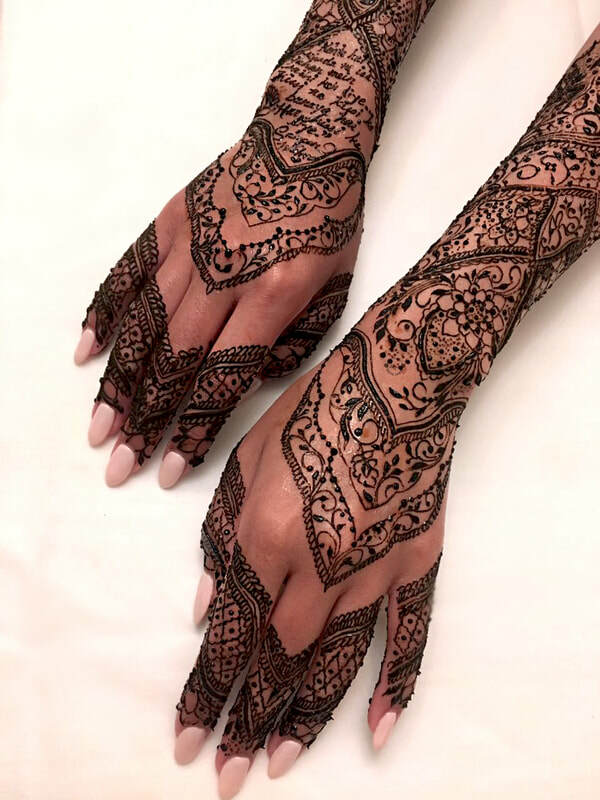 The Bride that wishes to have her hands and feet adorned as intricately as possible. 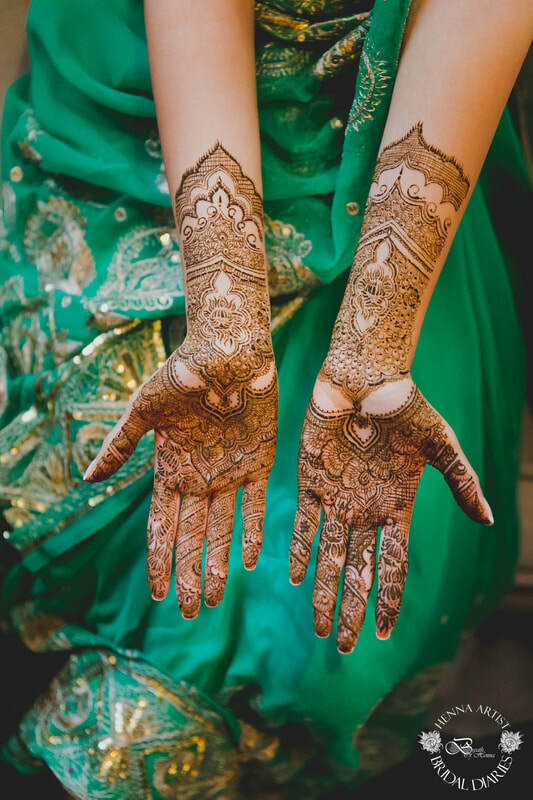 The ​story of her marriage is versed in the eclectic fashion choices for her wedding gown, which are reflected in Henna. She has two sides: an all traditional length and filling OR a very modern approach to the styled motifs cropped and scaled to fit her unique (gloves) design.